"That's my name. That's my name. Z is for Zackary" says my 3 year old every time he spots the letter Z somewhere. My mama heart is proud that he knows that the letter Z is his letter, but it's probably time I start exposing him to the other letters that make up his name. That's why I made this simple, no-mess Name Recognition Sensory Bag. I know sensory play is supposed to be a bit messy-- there's definitely a time and place for that. However, sometimes mama just doesn't want the mess, but wants the the benefits of sensory play-- in this case, tactile exploration. Gather enough glass gems to spell your child's name. Put a letter sticker on each glass gem spelling out your child's name. Cover with a layer of mod podge and let them dry. Once the letter manipulatives are dry, add them to a ziplock bag along with about a 1/4 cup of corn syrup or hair gel. We have successfully used corn syrup before in our Hibernation Sensory Bag. Seal the bag and add Batman duct tape to all four sides of the bag. 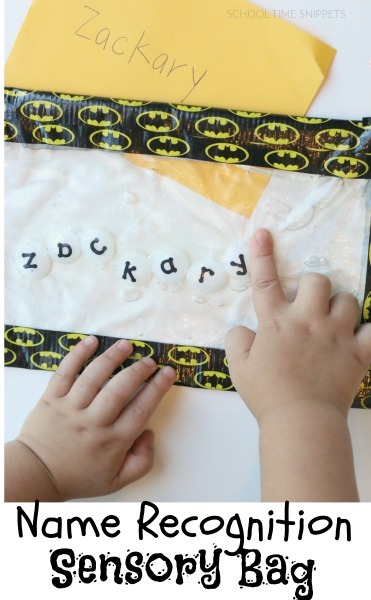 Now your child is ready to explore his/her name sensory bag! Prior to showing my son his cool, new Sensory Bag, I wrote his name out on a piece of paper to help him put the letters in the correct order. 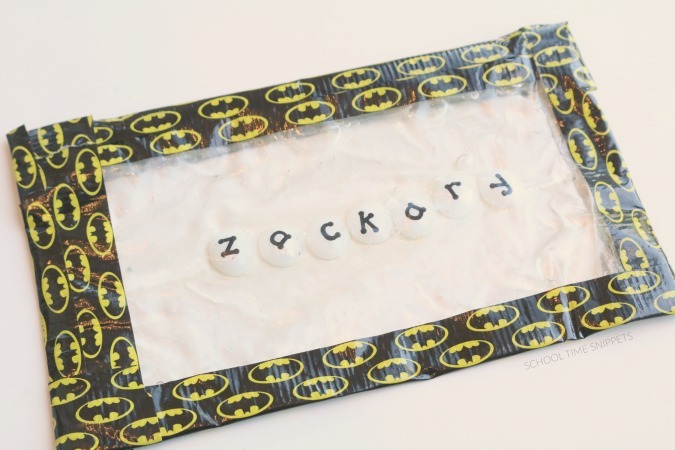 Encourage your child to poke and push the glass gem letter manipulatives in the correct order to spell his/her name! Yeah! for no messes and yeah! 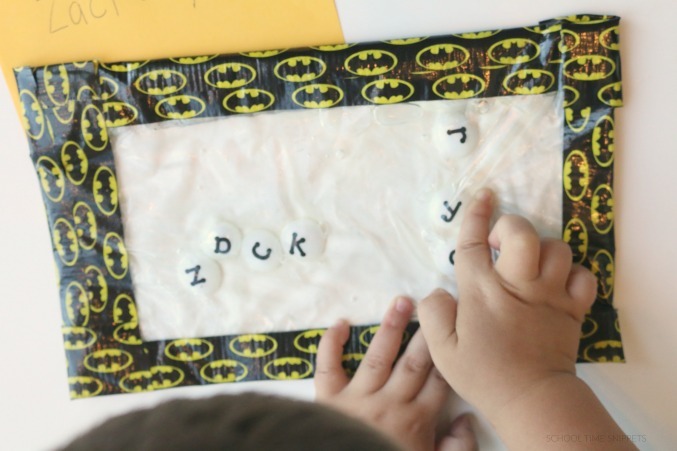 for a fun way to help your child learn the letters in his/her name!